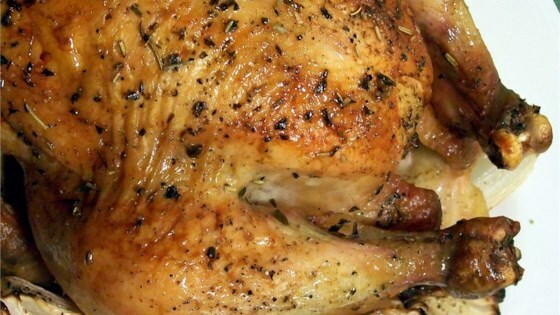 "People are always raving about chicken and rosemary, when I think chicken and fresh thyme is superior. This is so easy it's criminal, and the results are fabulous. I sometimes add four or five bulbs of green garlic if I find it at the farmers' market." The onions were good, but the chicken was unremarkable. My family loved this recipe. By far the best baked chicken I've ever had. Great taste. We don't use butter and the chicken was fine without it. Didn't know what was meant by "line with thyme sprigs" so I tucked some under the skin and put more inside with the lemon.